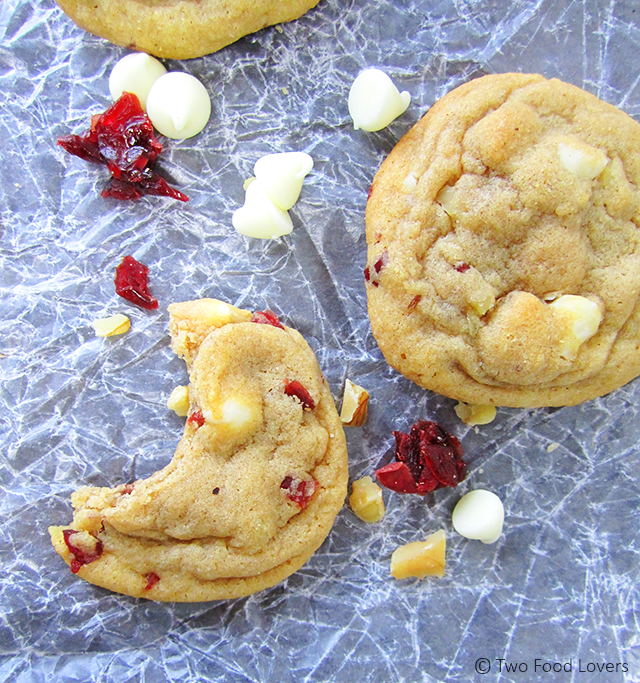 The most perfect cookie base gets loaded with cranberries, white chocolate chips and walnut pieces in this spectacular cookie. Yes, I have the secret recipe for a perfect cookie! You can stuff just about anything your heart desires into the dough to make it your own. 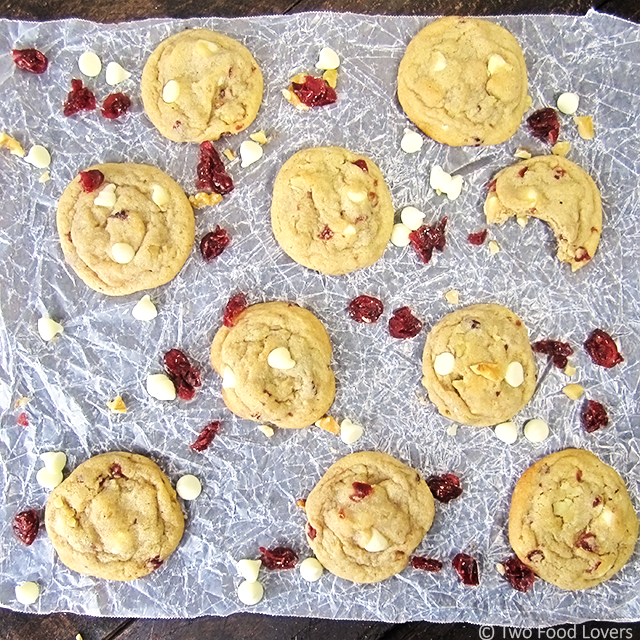 For now, we can swoon over these Cranberry White Chocolate Walnut Cookies. I like to call these cookies the CWCWC. Cranberry. White chocolate. Walnut. Cookies. They are a mouthful. Literally....I was stuffing my mouth. So delicious. The key to this perfect cookie is its tender, cookie dough base. I said it, and I meant it. This cookie dough is my absolute favorite. It is the perfect balance of moist and chewy, crumbly, but strong enough to be loaded with your favorite chips and extras, and it bakes so perfectly. No over-browning. No crunchy-ness. (Unless you like crunchy, more later.) Just brown sugar and buttered perfection. Cornstarch - One of my favorite ingredients in the kitchen. Why yes, you do use cornstarch to thicken your soup. I also like to use it in all my fruit pie fillings, but here, in this freakin awesome cookie, cornstarch adds softness to the dough. Brown sugar - This is what you want to use to achieve tenderness and sweetness in a baked good. Brown sugar is sweetened with molasses, thus making it more moist than white sugar. Moisture in your cookie is always a win. Bake time - For that perfect, un-browned, soft-in-the-middle cookie, underbake your cookie. No, it won't be raw. Just still slightly soft. As the cookie cools on the sheet, it sets up. These cookies can live in an air-tight container for over a week and STILL be soft and chewy. We've tested that statement. Taller cookie dough balls - I use a 2 tablespoon size cookie scoop for these cookies. After scooping the dough, I drop it on the sheet and use my fingers to build it up, just slightly. Essentially, I'm making my cookie dough mound a little taller. This prevents the cookie from spreading during baking, thus making your cookie thicker, softer, chewier. Chill your cookie dough - THIS tip might be the most important. I used to think it was silly, but once I finally started chilling my cookie dough before baking, I saw a huge improvement in baked goodies. It makes sense. Think of how perfect those break apart Nestle cookies are. Fresh from the fridge (and not so freshly off the mass production lines), they bake so well. Yours can be better, I promise. Chill the dough for at least 2 hours, or up to 3 days. The beauty of chilling dough is that you can make your cookies ahead of time, and simply scoop and bake when you want fresh cookies. And yes, you can freeze it too. I freeze batches of dough, place in the fridge the night before I need to bake, and scoop and bake according to the recipe. Step 1: In a medium bowl combine the flour, cornstarch, baking soda and salt by stirring with a wooden spoon or whisk. Set aside. Step 2: Using a stand mixer, or handheld mixer, cream the butter and sugars on medium-low speed for 1 ½ to 2 ½ minutes until light and fluffy. * Add the egg and vanilla and mix until just combined. Slowly add the flour mixture while mixing on a low speed. Mix until no streaks remain and dough is thoroughly combined. Using a wooden spoon, stir in the cranberries, chips and nuts. Step 3: Cover bowl with cling wrap or a lid and chill dough in refrigerator for a minimum of 2 hours. You can store dough for up to 3 days. * If you chill dough for more than 2 hours, allow it to sit on the counter for 15-30 minutes to make scooping easier. After dough has chilled, preheat oven to 350 degrees F; line two baking sheets with parchment paper; use a standard cookie scoop or a tablespoon to scoop dough onto cookie sheets, 1-2 inches apart. Use fingers to shape dough into slightly taller balls. Step 4: Bake for 8-10 minutes. * The edges of the cookies will be slightly brown, but the centers will not brown and look slightly undercooked. 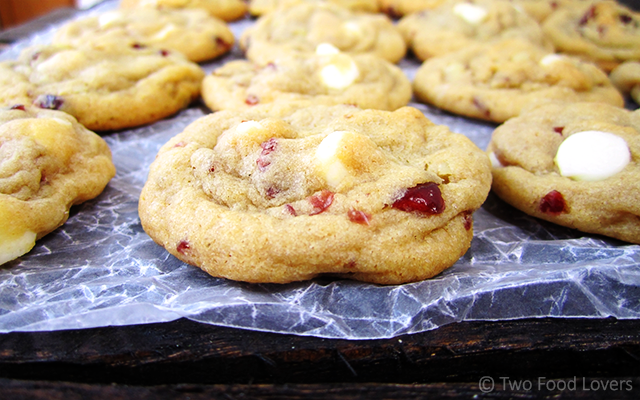 Allow cookies to cool 5-10 minutes on the cookie sheet before transferring to a wire rack. 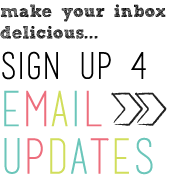 Store cookies in an airtight container for up to 7 days! *I always use a stand mixer for my cookie recipes. If you use a handheld mixer, I recommend using the low speed settings. I have found that hand held mixers tend to beat at a higher speed and you don’t want to over mix. *Chilling is a must for creating the perfect cookie! I love whipping up batches of dough ahead of time. I’ve let my dough stay in the fridge for up to 3 days. The longer your dough chills, the harder it is to scoop. Let chilled dough sit on the counter for 15-30 minutes to soften just enough to scoop. Do not let it get room temperature! *If you prefer a crunchy cookie, simply bake an extra 2-3 minutes until your cookie starts to brown.